Lanteria HR is now integrated with ADP Workforce Now®, an all-in-one platform for payroll, HR, time, talent and benefits. ADP is a comprehensive global provider of cloud-based human capital management (HCM) solutions that unite HR, payroll, talent, time, tax and benefits administration, and a leader in business outsourcing services, analytics and compliance expertise. This integration allows transferring workers data from ADP Workforce Now® to Lanteria HR in the JSON format and, as a result, automatically create or update employees in Lanteria HR. How this integration is made possible? To be able to transfer data from ADP Workforce Now to Lanteria HR, the Data Connector is used that can be acquired with any edition of the Lanteria HR for ADP Workforce Now app on the ADP marketplace. There is an option to purchase only Data Connector if necessary. When integration is deployed and configured, data transfer is performed with the help of the LHR - ADP Integration job, which is by default is run once every 24 hours (the schedule can be changed to suit your business needs). 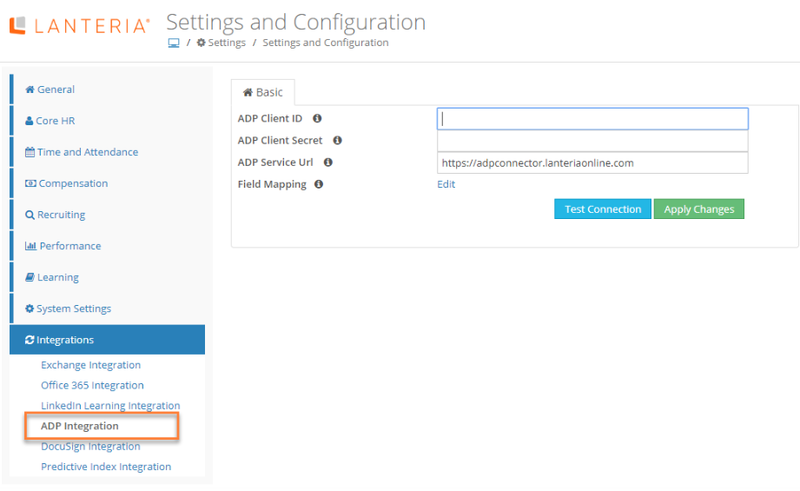 To configure integration with ADP, the Lanteria HR administrator must configure ADP Integration settings where an ADP client ID and ADP client secret GUIDs are specified along with eh ADP service URL that that will be used for integration with ADP Workforce Now. The unique ADP client ID and ADP client secret GUIDs are generated upon acquiring the Lanteria HR Data Connector license. Note: When purchasing a subscription to Lanteria HR (or the Lanteria HR Data Connector only) on the ADP marketplace, ensure that, in the Consent Request window, you choose to ALLOW to authorize ADP to provide your personal data to Lanteria HR. Otherwise, the Lanteria HR administrator will not be able to obtain the client ID and client secret GUIDs, which are required to configure the integration on the Lanteria HR side. 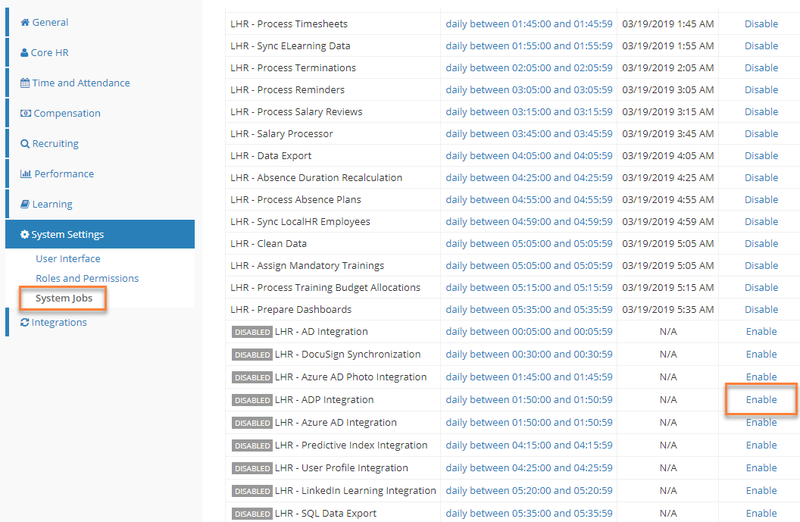 Then, Lanteria HR administrator enables the LHR - ADP integration job and configures its run schedule. Additionally, the Lanteria HR administrator can edit the default field mapping if need be. This field mapping defines which employee-related fields in Lanteria HR correspond to which worker (employee-related) fields in ADP Workforce Now so that the LHR - ADP Integration job in could retrieve workers (employees) data from ADP Workforce Now and create or update employees in Lanteria HR properly. The ADP Customer updates or creates a worker (employee) in ADP Workforce Now. It is assumed that all integration requirements are met, and the customer has already purchased the Lanteria HR Data Connector, which is required to retrieve data from ADP Workforce Now into Lanteria HR. The LHR - ADP integration job is run in accordance with its schedule or manually. The LHR - ADP integration job retrieves employee data from ADP Workforce Now in the JSON format with the help of the Lanteria HR Data Connector and uses this data to update or create employees in Lanteria HR.